We have so many generous business donors to thank this winter! First, CCH would like to humbly thank the staff of Call One, Inc. for choosing to support our work for a second year. 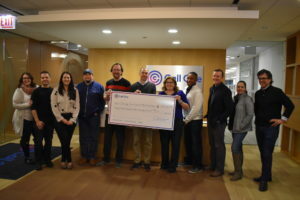 Call One staffers raised an impressive $25,360 during 2018 through a variety of fundraisers, including its annual Caddyshack golf outing. Another partnership that dates back over a decade is Zumiez. The apparel company donates several pallets of new winter coats and outwear to CCH each year. We have come to rely on their generosity to help hundreds of people each winter with whom we outreach in Chicago area shelters. The same can be said of Blistex, Inc., which each year gives a combination of money and products for distribution, including lip balm and foot cream. The retail store, That’s Our Bag, is another annual donor that we are always happy to hear from as they give us new travel bags every year. We were proud to take on new partnerships this winter season as well. The good people from Chance the Rapper’s charity, SocialWorks, invited CCH to bring homeless families to two of their signature Warmest Winter events – A Night at The Museum and the Taste for the Homeless. Another great partnership in the works – the newly emerging non-profit GiveNkind, which matches up donations of valuable products and goods to non-profits that needs them. Through their efforts, CCH was able to give out over 100 portable cell phone battery chargers. Boxes of beautiful hat, glove and scarf sets were donated by staff of the National Black MBA Association‘s Chicago chapter office. Furious Spoon gave furiously when its celebrated ramen restaurants generously raised $6,000 to support CCH’s work this season. Also on the culinary front, Captain Porky’s seafood and barbecue eatery in suburban Wadsworth donated a share of their sales during the Polar Vortex. The results were almost $1,000! Local brewery Goose Island is looking to settle a debate on whether Chicagoans are more Pro-Dibs or Anti-Dibs by releasing a special beer in two distinct cans. A portion of the profits will benefit our work, with a Feb. 2 event raising $1,085 for CCH. And coming up: On Saturday, February 23, Empty Bottle at 1035 N. Western Ave., will collect donations on behalf of CCH at its annual Music Frozen Dancing Winter Block Party. ← Join CCH at Dear Evan Hansen!